The planned new product launch, announced at the show will continue to show three new models this spring, and starting the first time this fall. 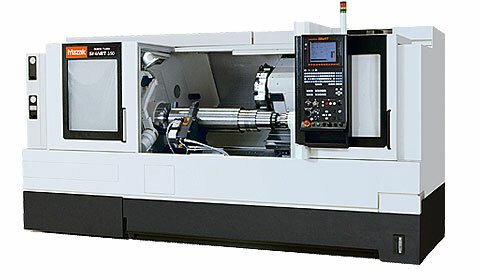 Then, a new 2-axis CNC lathe "QUICK TURN SMART" series 3 model September 8 - September 10 Inobeshi day sold in Yonfea. "QUICK TURN SMART" series is a simple, compact, high throughput machine. World standard 2-axis CNC lathe, QUICK TURN was developed from the 1981 series and was released in 2002 as QUICK TURN NEXUS series was born from the accumulated know-how with interactive CNC programming system "MAZATROL”. “SMART" is a new development, reviewing the design from scratch, accuracy, ease of use, refining and improving the basic performance features. It will be approximately 10 percent compared with conventional equipment and an improvement in productivity. In addition, the price had been 10 percent compared to the conventional model reduction. The QUICK TURN SMART series is the genesis of the “SMART” brand, launching in Japan, the United States, Europe, and Asia.